Premium cotton tips made from 100% cotton. Ideal for cleaning the outer ear and precision touch up of make-up. 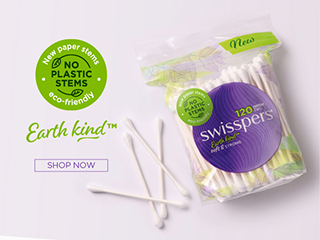 Swisspers Cotton Tips are made from 100% cotton and are soft and absorbent. In addition to cleaning the outer ear, they are ideal for precision application and touch-ups of make-up. The plastic stem provides excellent strength and flexibility. Use your cotton tip to clean the outer nooks and crannies around your ear. Poking it directly into the ear canal can cause damage. DO NOT INSERT COTTON TIP INTO EAR CANAL. Dip cotton tip in makeup remover to touch up your makeup. Always dispose of in the rubbish bin, never dispose of in the toilet.